As of 2 p.m. today, with five hours to go until polls close, the percentage of Arlington voters casting ballots in the Republican presidential primary has already exceeded the total from the 2008 GOP primary. Mid-day Super Tuesday turnout was 24 percent of registered voters in Arlington — 9 percent Republican, 15 percent Democrat. In 2008, when Barack Obama and John McCain cruised to victory in Virginia, 7 percent of registered Arlington voters cast Republican ballots while 33 percent voted in the Democratic primary. 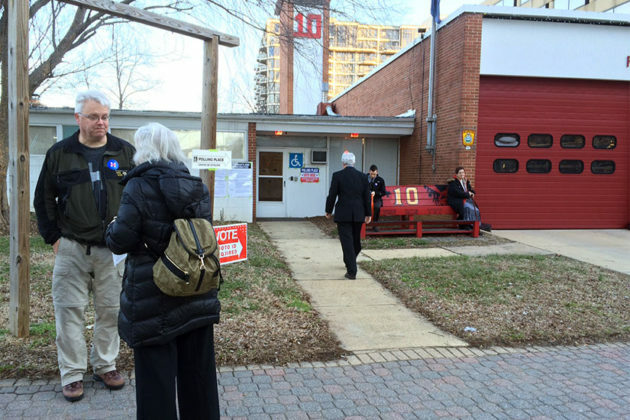 “For the Republican primary in particular, it’s been a heavier than expected turnout,” said Arlington County Registrar Linda Lindberg. Democratic turnout, she predicted, is likely to be down slightly from 2008. Absentee voting is up across all parties, but especially so for Republicans. This year, 2,570 Democratic and 952 Republican ballots were cast, compared to 2,166 Democratic and 440 Republican ballots in 2008. Lindberg said polling places along the Orange Line corridor and in South Arlington, all Democratic strongholds, have seen surprisingly heavy Republican turnout, while turnout is in line with expectations in some of the more Republican-leaning precincts in far northern Arlington. That raises the possibility of crossover voting; Virginia is one of 18 states with an open presidential primary. One factor for the increased Republican turnout may be the presence of Donald Trump in the race. Supporters of the businessman and GOP frontrunner have been particularly prolific in placing signs around polling places in Arlington — so much so that Lindberg said the county elections office has received at least one complaint about the Woodmont polling station having too many Trump signs. 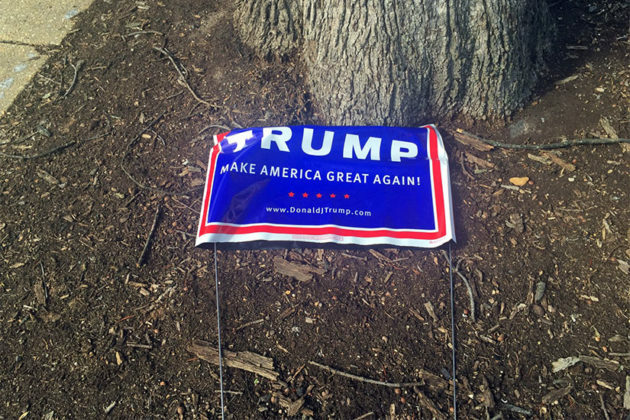 One Trump supporter got an earful this morning while placing signs around Arlington. Reuters reported that former Republican congressional candidate Gwendolyn Beck was putting Trump signs up in front of the Arlington Arts Center, in Virginia Square, when local attorney and cycling advocate Mark Blacknell walked by en route to a nearby polling place. “I came here to tell you you’re a terrible person,” Blacknell told Beck, according to Reuters. “Signs normally don’t bother me, but there’s a whiff of burning crosses to Trump’s,” Blacknell later explained. “Respect for other opinion is fabric [sic] of the USA,” Beck said in response, via Twitter. No significant problems have been reported at the polls, Lindberg said, though a slight discrepancy between Arlington’s voting instructions and those on the state-provided ballots are prompting some questions. The instructions in the polling places say that voters may place an “X” in the bubble to mark their vote for a candidate. Virginia’s ballots have older instructions, telling voters to completely fill in the bubble. Either works just fine, said Lindberg. “It’s just confused a few voters, that’s all,” she said. 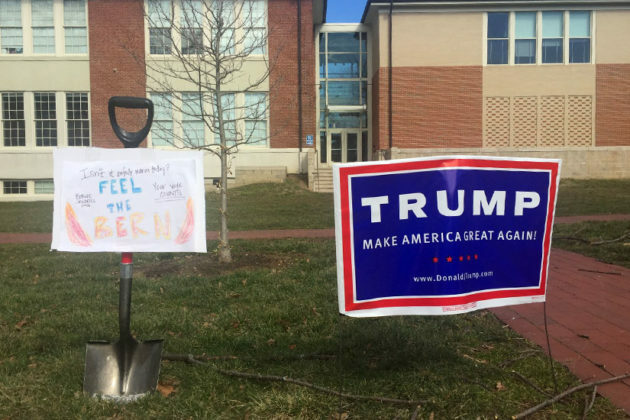 After the jump: tweets from those commenting on the Trump signs around Arlington, as well as a tweet from this afternoon’s John Kasich rally at George Mason University in Virginia Square. People saying that the only signage outside Hume 008 precinct in Arlington belongs to Trump. No greeters either.